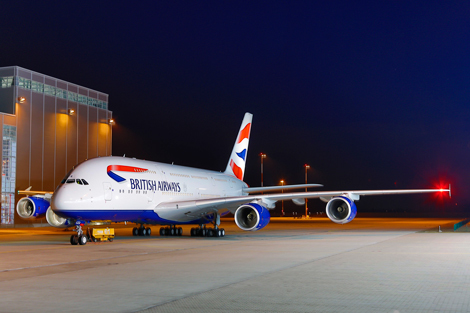 British Airways – First A380 Enters Service. British Airways’ first A380 flew its first official longhaul service today with its inaugural flight to Los Angeles. Five A380 services a week will now operate between London Heathrow and Los Angeles, increasing to a double daily service from 10 April 2014. From 22 October, daily A380 services will start between London Heathrow and Hong Kong. Johannesburg is the third A380 destination, with services planned to start from 12 February 2014. British Airways took delivery of its second A380 over the past weekend, with a third due next month. https://gtm.uk.com/wp-content/uploads/2015/05/logo_trans.png 0 0 Paul https://gtm.uk.com/wp-content/uploads/2015/05/logo_trans.png Paul2013-09-24 16:55:192013-09-24 16:55:19British Airways - First A380 Enters Service. British Airways is currently flying its new Airbus A380 aircraft between London Heathrow and Frankfurt on selected flights. The aircraft’s official inaugural flight is on Tuesday 24th September between London Heathrow and LAX. In the meantime, grab your chance of flying on the A380 in Europe. Please call us for further information.